Boat Description Pro Team 185the top of the line in the Pro Team familyis the roomiest and best-designed Mod V bass fishing layout available anywhere. 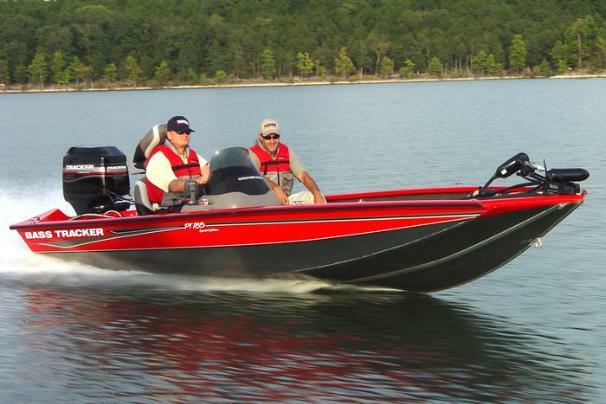 Generous three-across seating, two seven-foot rod lockers for gear and an oversized bow casting deck. The exclusive all-welded Revolution hull (with Smooth Ride Guarantee) delivers the smoothest, driest, best handling ride. Sleek, painted hull sides and gunnels, with natural aluminum bottom for durability. Package includes Mercury Pro Series outboard, Lowrance X37 fish finder, MotorGuide foot-controlled trolling motor and aerated livewell with timer, recirculation and pump-out plus our easy-to-tow custom trailer with GalvaShield protection, EZ lube hubs and swing-away tongue with retractable safety cables. Dry Weight 972 lb approx.